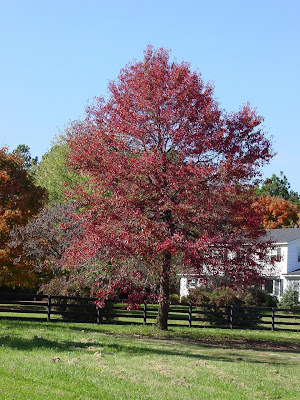 Modern Gardener: Black Tupelo Tree "Blackgum"
Black Tupelo (Nyssa sylvatica), is a medium-sized deciduous tree which grows around 20-25 m (65-80 ft) tall (rarely to 35 m) and a trunk diameter of 50-100 cm (20-40 in) (rarely up to 170 cm). It is native to eastern North America, from New England and southern Ontario south to central Florida and eastern Texas. The species is often known as simply Tupelo, but the full name Black Tupelo helps distinguish it from the other species of tupelo, some of which (Water Tupelo N. aquatica and Swamp Tupelo N. biflora) occur in the same area. The name Tupelo is of Native American origin. Other names include Blackgum, Pepperidge, Sourgum, and (on Martha's Vineyard) Beetlebung, this last perhaps from the mallet known as a beetle, used for hammering bungs, or stoppers, into barrels ("Beetlebung" and other tupelo lore). The scientific name means "nymph of the woods" in Greek. The leaf of Black Tupelo is variable in size and shape. It can be oval, elliptical or obovate, and 5-12 cm (2-5 in) long. It is lustrous, with entire, often wavy margins. The leaf turns purple in autumn, eventually becoming an intense bright scarlet. The flower is very small, greenish-white in clusters at the top of a long stalk. The fruit is a black-blue, ovoid stone fruit, about 10 mm long with a thin, oily, bitter-to-sour flesh. There are from one to three such fruit together on a long slender stalk. The bark is dark grey and flaky when young, but it becomes furrowed with age, resembling alligator hide on very old stems. The twigs of this tree are reddish-brown, usually hidden by a greyish skin. The pith is chambered with greenish partitions. The branches typically stand at right angles to the trunk. ∑ Bark: Light reddish brown, deeply furrowed and scaly. Branchlets at first pale green to orange, sometimes smooth, often downy, later dark brown. ∑ Wood: Pale yellow, sapwood white; heavy, strong, very tough, hard to split, not durable in contact with the soil. Used for turnery. Sp. gr., 0.6353; weight of cu. ft., 39.59. ∑ Winter buds: Dark red, obtuse, one-fourth of an inch long. Inner scales enlarge with the growing shoot, becoming red before they fall. ∑ Leaves: Alternate, often crowded at the end of the lateral branches, simple, linear, oblong to oval, two to five inches long, one-half to three inches broad, wedge-shaped or rounded at base, entire, with margin slightly thickened, acute or acuminate. They come out of the bud conduplicate, coated beneath with rusty tomentum, when full grown are thick, dark green, very shining above, pale and often hairy beneath. Feather-veined, midrib and primary veins prominent beneath. In autumn they turn bright scarlet, or yellow and scarlet. Petioles one-quarter to one-half an inch long, slender or stout, terete or margined, often red. ∑ Flowers: May, June, when leaves are half grown. Polygamodiœcious, yellowish green, borne on slender downy peduncles. Staminate in many-flowered heads; pistillate in two to several flowered clusters. ∑ Corolla: Petals five, imbricate in bud, yellow green, ovate, thick, slightly spreading, inserted on the margin of the conspicuous disk. ∑ Stamens: Five to twelve. In staminate flowers exserted, in pistillate short, often wanting. ∑ Pistil: Ovary inferior, one to two-celled; style stout, exserted, reflexed above the middle. Entirely wanting in sterile flower. Ovules, one in each cell. ∑ Fruit: Fleshy drupe, one to three from each flower cluster. Ovoid, two-thirds of an inch long, dark blue, acid. Stone more or less ridged. October. The Black Tupelo (Nyssa Sylvatica) grows best in well drained areas. Nyssa Aquatica grows best in swamps or lowlands that have poor drainage. Usually reaches the height of fifty feet and occasionally one hundred; variable in form. Roots are large, striking deep. The limbs deteriorate early and the decayed holes make excellent dens for squirrels, raccoons, opossums and honeybees. Hollow sections of trunk were formerly used as bee gums by beekeepers. The glossy beauty of the Tupelo is undoubtely the reason why it so often is permitted to escape the levelling axe and allowed to stand in the fields with the elm, oak, and maple. In such a situation its contour is as individual as that of any of its companions. The stem rises to the summit fo the tree in one tapering unbroken shaft, the branches come out at right angles to the trunk and either extend horizontally or droop a little, making a long-narrow, cone-like head. The spray is fine and abundant and lies horizontally so that the foliage arrangement is not unlike that of the beech. The leaves are short petioled and so have little individual motion, but the branch sways as a whole. The tree rarely flourishes in exposed positions, it dies at the top and lives on in a half-hearted way until the friendly axe ends the unequal struggle. But, allowed to grow in freedom, sheltered but not crowded, it develops a full round head and lives to good old age. The flowers are inconspicuous, but the fruit is quite marked, dark blue, in clusters of two or three, sour but eagerly sought by the birds. Its autumnal coloring is superb; the foliage becomes one glowing mass of scarlet, sometimes dashed with orange. It is the most fiery and brilliant of all that brilliant group: the maple, dogwood, sassafras, liquidambar, and tupelo. The wood is hard, cross-grained, and difficult to split, especially after drying. It is used for pallets, rough floors, pulpwood and firewood. It is also grown as an ornamental tree in parks and large gardens, with its often spectacular intense red to purple fall color being highly valued. The Black Tupelo is an important food source for many migrating birds in the fall. It's early color change (foliar fruit flagging) is thought to attract birds to the available fruit, which ripen before many other fall fruits and berries. Birds recorded to feed on the fruit include: American Robin, Swainson's Thrush, Gray-cheeked Thrush, Hermit Thrush, Wood Thrush, Northern Cardinal, Northern Mockingbird, Blue Jay, Red-bellied Woodpecker, Yellow-bellied Sapsucker, Northern Flicker, Pileated Woodpecker, Eastern Phoebe, Brown Thrasher, Eastern Bluebird, European Starling, Scarlet Tanager, Gray Catbird, Cedar Waxwing, and American Crow, all primarily eastern birds migrating or residing year-round within the tree's range.